With blatantly bold imagery and lively colours this church showcases the life and times of St Cecilia along with her husband Valeriano. If your visit to Bologna is a short one you would not want to miss the church of St. Cecilia- this is undoubtedly a hidden gem! Found in the year 1267, the church flaunts exquisite Renaissances art work along with 15th century architecture. The façade displays beautiful blend of Romanesque and Venetian style, the portico on the other hand basks of gothic characteristics leading to the interiors which exhibits baroque additions and a number of frescos. The murals are extremely stunning and immediately catch your attention, especially with the vibrant colours used! 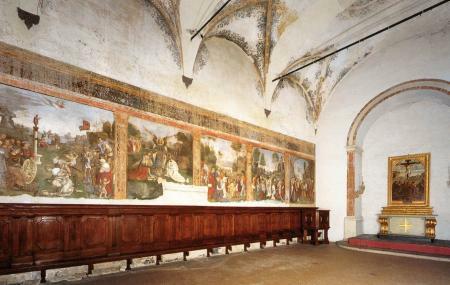 The staff is very enthusiastic and helpful; one can arrange for a guided English tour to know more about the history of the frescos. Unfortunately cameras are not allowed inside the church, but the beauty of the murals will surely remain etched in one’s memory! Adding to the experience is a musical concert, the performance happens time to time and the schedule is displayed on a board outside. These musicians are professionals and in simples words- magnificent! Details for concert tickets are displayed outside the church. Check the boards outside for regular events. How popular is Oratorio Di Santa Cecilia? People normally club together Museo Ducati Or Ducati Museum and San Colombano - Collezione Tagliavini while planning their visit to Oratorio Di Santa Cecilia.